The World Series of Poker has posted the official schedule for its upcoming tournament series in Australia at the Crown Melbourne Casino (which is also the home of the Aussie Millions tournament series). 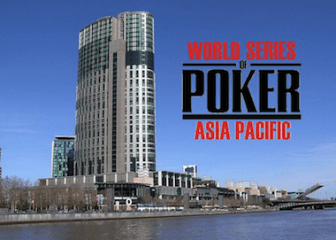 The inaugural World Series of Poker Asia-Pacific, or WSOP APAC for short, will run from April 4th to April 15th, 2013. The tournament series will feature seven events, five of which WSOP bracelets to the champions. In addition to the $10,000 Main Event, the WSOP APAC series will host a $50,000 high-roller tournament (one of the two non-bracelet tournaments), as well as an interesting new format the WSOP is calling “The Accumulator”. The “Accumulator” tournament will feature a $1,100 buy-in and three starting days; players can enter on as many days as they choose and all chips they have accumulated over the Day 1 flights will be given to them at the start of Day 2 –sort of like a reentry tournament on PED’s. While I’m not really high on the “Accumulator” format (it seems to favor players with deep pockets and anyone entering on only one or two days would seem to be at an extreme disadvantage) it’s an interesting formatting tweak, so I’ll let it play out before passing any further judgment.